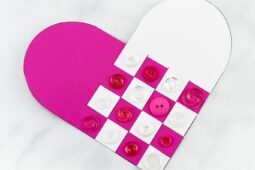 Reminiscent of Scandinavian Woven Hearts, this Woven Heart Craft is an easy and fun Valentine’s Day craft for kids of all ages to make at school or home. Print the woven heart template in a variety of colors. Invite your child to choose two colors, then cut out the patterns along the border and interior black lines. Invite your child to weave the two shapes together to form a heart shape by gently bending and positioning the paper strips. Secure the edges of the heart with a glue stick or double-sided tape. If desired, flip the heart so the outlines are in the back (we chose to show the black outlines). Squeeze a dot of glue in the middle of each square. Press a color coordinated button to each dot of glue. Allow the glue to dry completely. Repeat, using a variety of colors! Your woven heart craft is complete!